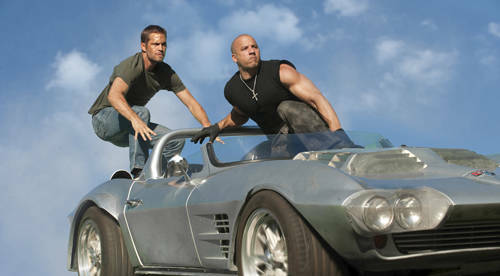 The original “The Fast and Furious” was exactly that, fast furious, silly and laser focused on it’s young male target market. The law of diminishing quality applied to the sequels, if not box office but this fifth installment has well and truly bucked the trend. This latest offering reuniting many of the original cast but also dragging in the “The Rock” to really drive home the message, this is a more substantial film. We still get the obligatory coupe of scenes with flash cars, models with painted on outfits and the whole project exudes testosterone from every pore. There is however more heart here, it does mean something, not much but there is a heist story in there holding the whole premise together. Paul Walker and Van Diesel reprise their roles, clearly finding work outside the franchise not as lucrative or productive as they had hoped. There is a lot of gunplay and the body count is high but in keeping with the certificate, everyone dies very cleanly with little gore on display, an A-Team for the new generation. This time we are firmly based in South America, Rio Janeiro amongst the Fave-la’s, read very poor areas, where filming must have been difficult with the crowds that must have accumulated. We have lots of running over roofs, jumps and great helicopter shots, that would presumably would have been impossible in a more risk averse and libelous urban setting. Following a spectacular “break out”, which in reality no-one would have survived, we start with Brian O’Conner (Walker) and girlfriend Mia Toretta (Jordana Brewster) at a low ebb. They are in Rio on the run, visiting their old friend Vince (Matt Schulze), for a bit of a feed and the possibility of another job, as funds are definitely low. The job on offer involves boosting high end cars from a moving train, an action sequence which is very impressive, in a “looks like somebody is actually doing most of this”, kind of way. It is preposterous of course but if you want real life drama and social commentary, anything with Fast and Furious in the title will not be high on your list. The rather dubious moral aspects of stealing stuff and getting rich quick are certainly not explored, nobody has a real job and as always, driving cars really fast in dangerous situations, is always completely safe and fun. Once the cars are obtained with Dominic Toretta’s help (Diesel), the old gang is assembled as they realize they have stumbled onto something bigger, involving the obligatory king drug lord Hernan Reyes (Joaquim de Almeida). We know he is an overlord as he kills an underling in off hand manner, sometimes it would be good to see a drug lord forgive a minion for a minor infraction, at least it would be something new. The gang come to the attention of the elite US Diplomatic Security Service (USS) backed squad led by Luke Hobbs (The Rock, Dwayne Johnson). This group act as police, judge and jury, seemingly wasting bad guys at will with apparent impunity. They are aided by the very pretty but initially mousey widow (Elsa Pataky) of the only apparently honest policeman in Rio. The assembled gang get little to do, apart from add legitimacy to the reinvented franchise, although Tyrese Gibson gets some good lines and comedy is ably provided by Tego and Don. The closing sequence is probably at 13 on a scale of 10 for believability but certainly will have stimulated the South American car industry with the number of cars destroyed. Diesel and the Rock dispense with any pretense of acting and just bulge muscles, fight at length and look macho, occasionally all at the same time. There are some unintentional laugh out loud moments but Paul Walker does slip in a few quiet moments of real acting when the crew and director were off planning the next stunt. Does what it sets out to do but at least with a little more style and substance than the last three entries. Will not be troubling Oscar but with top notch “real” stunts and a stronger plot, this shows the franchise may have more in the tank yet for those who like their action Fast, Furious and a bit daft.